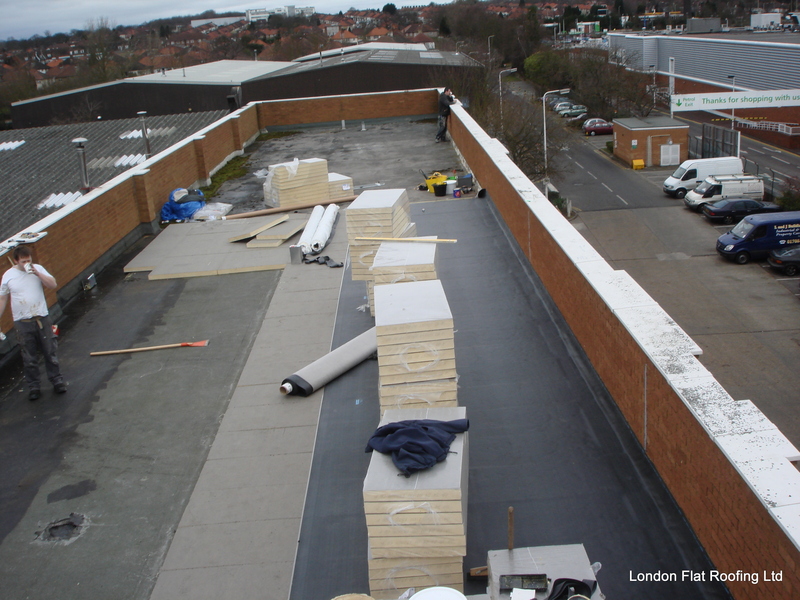 Roofing Contractor: London Flat Roofing Ltd. Solution: New EPDM roof with insulation. This commercial customer didn’t have to insulate the roof to the new building regulations. Being a commercial customer, the local authority did not enforce Part L of the Building Regulations. I discuss this on my page Part L of Building Regulations. 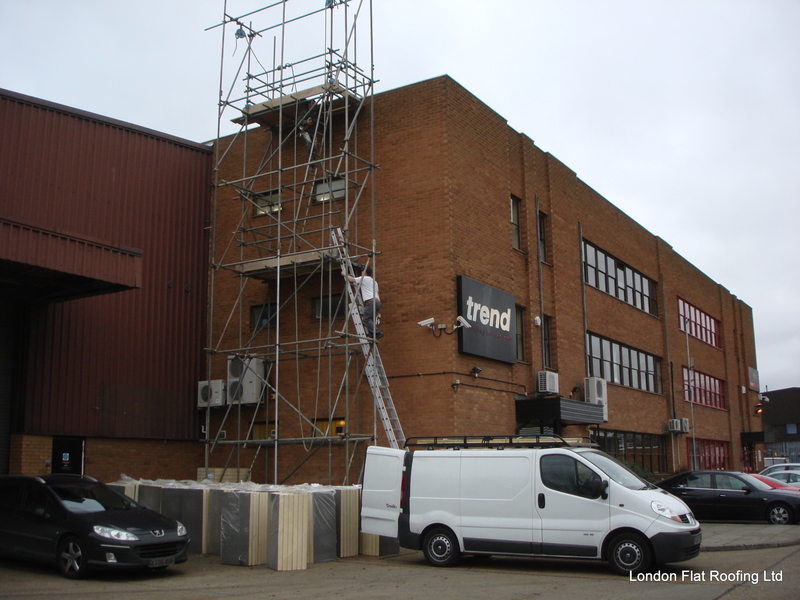 Before work started, a scaffolding tower was erected to gain access to the roof. A full inspection was undertaken of the old mineral felt roof and flashings, some repairs to the roof were made using liquid rubber however these failed, so it was decided that the roof would be re-covered using EPDM rubber. The customer chose also to insulate even though they had no obligation to do so (I discuss this later as most customers won’t insulate unless they have to, which is not good for the environment!). Just getting the materials for this new roof up onto the roof is a task in itself. 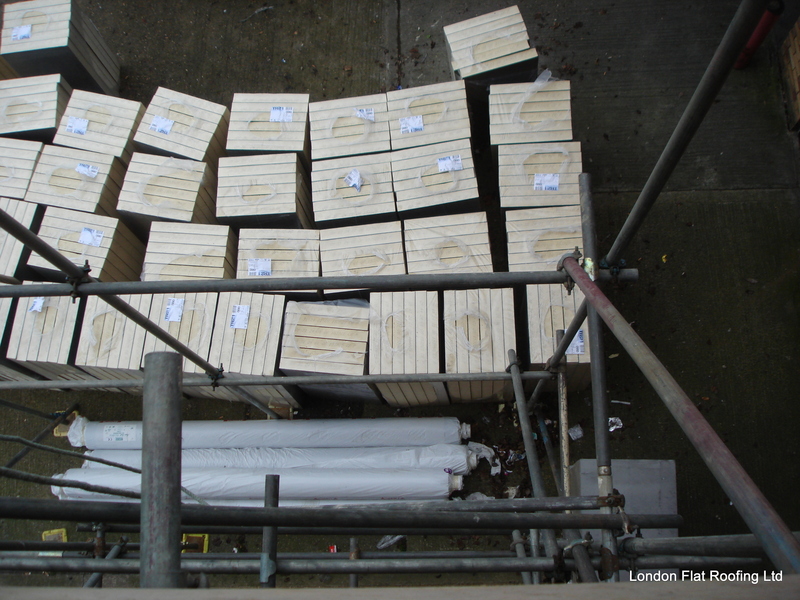 Just look at the amount of insulation that has to be taken up the scaffolding, each bundle has to be taken up separately so damage doesn’t occur. It takes 2 men most of the day to get the materials onto the roof, the EPDM rolls are particularly heavy and difficult to handle. Our next problem is to make sure the insulation doesn’t get wet overnight, and that the wind doesn’t blow them off the roof. 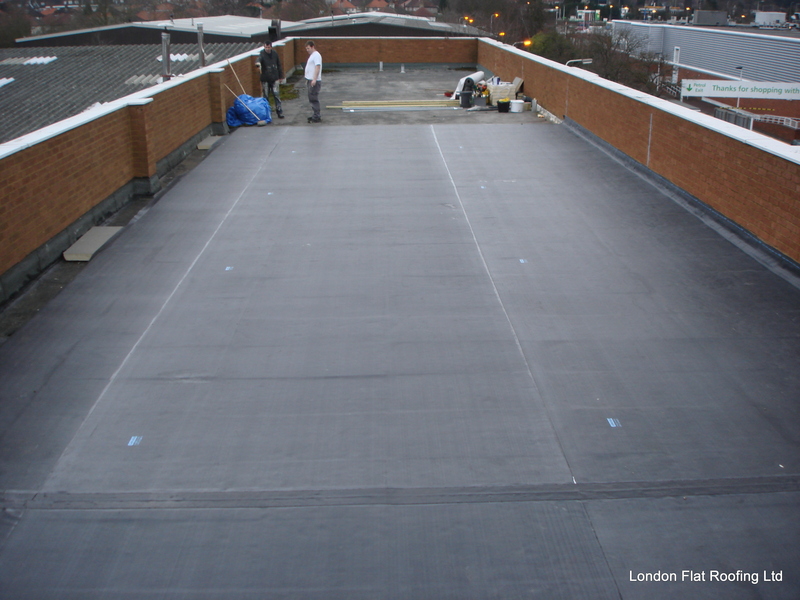 We completely cover the stack with tarpaulins for the night and use the EPDM to weigh the covering down. As we progress the complete roof gets covered with insulation. The following day we start to glue down the insulation using the correct metod and specified glue. You can see in this photo that the flat roof has been cleaned and the insulation is being glued down ready for the EPDM rubber to be laid over the top. Now we can start to get out the rolls of EPDM, lining them up ready for rolling out and gluing down. 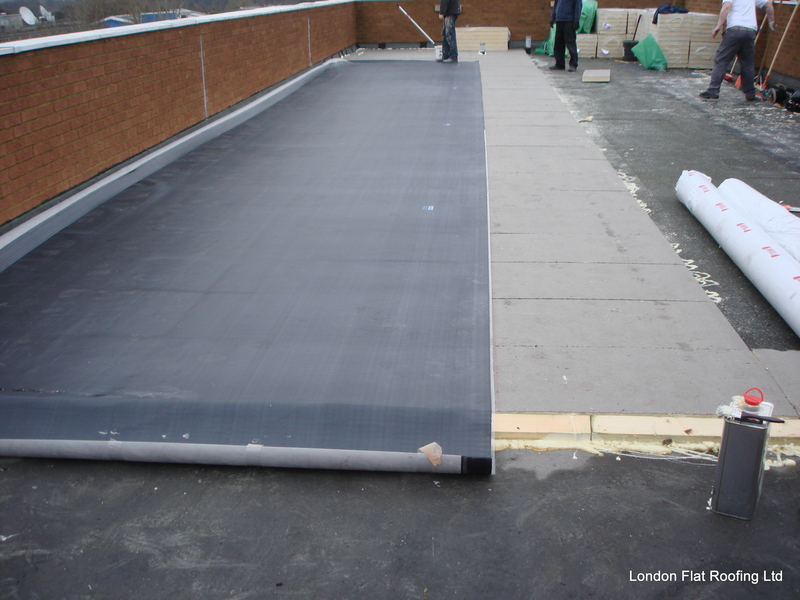 The EPDM we’re using here is fleece-backed; the fleece helps with the laying of the EPDM. The sheets of EPDM insulation rubber are 3m x 15m. We can now get larger sheets and tend to use those because there are less joints involved. However it’s not that joints are a problem, but when there is going to be a problem sometime down the road, 20, 30, 40, 50 years on we think the problem will come from the joints. The new sheets that are larger are not fleece-backed, sob they’re slightly harder to lay, but lighter and cheaper for the customer. This new EPDM roof is almost finished. We only need to finish the flashings to the perimeter and remove the scaffolding. info@London-Flat-Roofing.co.uk or leave a comment below. Its interesting now that EPDM rubber is really taking off in the UK and particulate London, we are sing several changes. First Firestone EPDM rubber is becoming the market favourite, because its comes in large sheets and is by far the cheapest EPDM rubber sheet on the market. The DIY market for EPDM rubber sheet is also taking off Ebay is selling it and some large roofing merchants are starting to stock EPDM rubber, however im also seeing a lot of badly installed epdm rubber roofs and mainly these are being installed to flat roofs by roofers that are not trained. 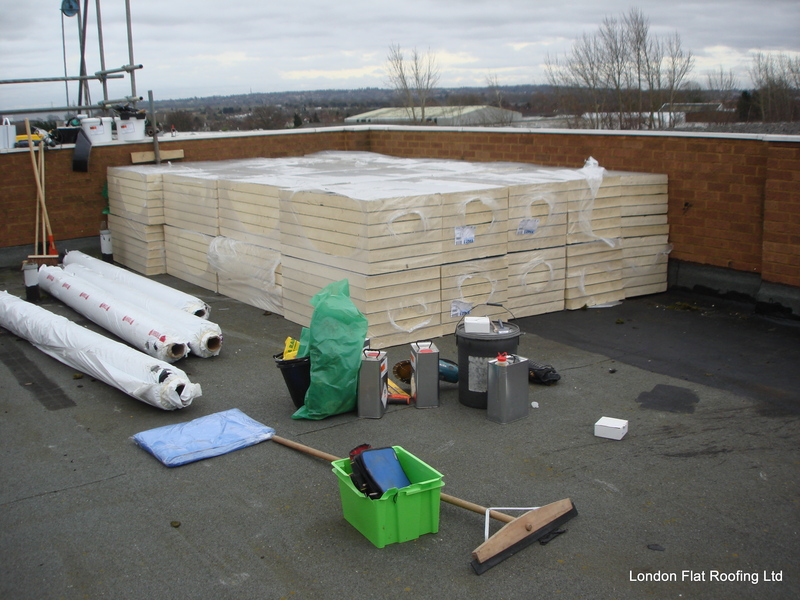 The biggest problem yet to hit us in the UK is going to be problems with roofs sweating, attention to vapour barriers is the problem insulation of flat roofs may seem to be a easy thing but the specification has to be correct. Great Case Study. Love the amount and quality of pictures. Looks like Rubber Roofing is here to stay! Very interesting reading…it looks terrific!